The set provides 6 bottles/pots of paint designed for WW II US Army Uniforms. This is set 1 of 2 sets in this series, and the paints provided are for Combat and Fatigue clothing and Class A uniforms. US Army uniforms are a whole new area for me to look at, and I pondered how best to do this review. Unscrewing the lids of the pots clearly wouldn’t be much help so I shall do the review in two parts. The first covering the contents and colours provided and the second as a painting experiment on a couple of standard figures. The set comes in a very nice cardboard presentation box (see photo). It is a professionally produced product with sharp art work on the front of the box and it states that these are Authentic Acrylic Colors with thanks to Marcello Biava. It also details the range of paints in the set on the top front and what their main purpose is for. On the reverse are a set of instructions in 4 languages, English, French, Italian and German outlining the correct use the paints. Lifecolor Paints are made by Astromodel, Genoa, Italy and my first encounter with them was on a recommendation from a friend who suggested their CS13 Flesh paint Set for facial painting. The paints come in sturdy plastic pots with a screw top. Each pot contains ‘net 22ml’ of paint. These are Acrylic paints and so should prove popular with modellers, for their ease of use and clean up. Detailed instructions on the use by airbrush or paint brush are contained on the reverse of the box, which I have re-printed below for clarity. Dilute color preferably with Lifecolor Thinner or, lacking this with water until reaching a thickness similar to water. When pouring the mixture color must not fall in drops or lumps but it has to flow easily and softly. Do not dilute Lifecolor with other substances or thinners of other brands because the mixture obtained could not be lasting and could spoil the color left in the pot. When using a color from an old and already used pot it is advisable to filter the product. To paint easily long an dthin lines with an airbrush it is important to dilute the color with Lifecolor Thinner which contains specila dispersants and to fix the air pressure at the minimum. A less quanity of air avoids color to dry on the needle of the airbrush while painting. Painting with a brush does not need special tricks. Remember with acrylic colors it is better to apply many diluted coats instead of denser one. Clean brushes and airbrush with water immediately after use. Possible marks of dry color can be removed by airbrush with trychloroethylene or similar solvents. Lifecolor Thinner does not remove color when dry. 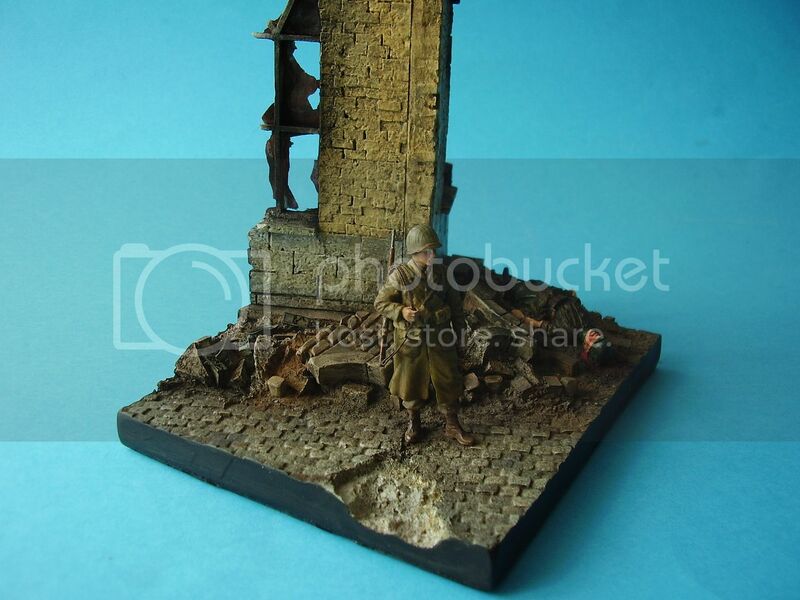 Mark Dollery recently reviewed set CS 14, Italian Camouflage Set on Historicus Forma. As I don’t airbrush his review should be helpful for those that do. Also just recently there has been a thread running on Armorama regarding Tamiya v Lifecolor, which may be of interest as this gives a wide range of user views and covers the spray painting issue nicely also. Life colour paints are water based paints which suits me fine. I don’t tend to try and cover things in one go, and my limited experience of their Flesh Paint set shows a slow natural build up of colour works best. For purposes of the review I’ll use some of the Dragon 1st Army at Remagen 1945 figures and see how things go, as this is, after all, a Uniform Paint Set. As I am interested in finish and not so much coverage, I undercoated the figures with some Tamiya XF 52 Flat Earth before I started with the experiments. I’ll also use the Life colour Box Art as a painting guide along with the painting guide from the kit. As Lifecolor is slightly more expensive than Tamiya paint this seems a logical step. Whilst I’m waiting for the paint to dry, ‘Why Flat Earth?’ I hear you ask. No particular reason other than I have several bottles as I use it for the base coat for my British Figures. Also a very talented figure painter once told me brown is a very good colour to use as a base for flesh tones. The two figures I’ll use are Figure A and Figure E from the Dragon kit. Figure A wears a long woollen coat and has standard Combat gear and Figure E is dressed in the 1943 style US Army uniform. After the undercoat, the first LifeColor I applied was in fact not one from the set but UA 709 Flesh 1st base. Life colour paints I find ‘flow’ really well and are best applied with a wet brush, giving 2/3 additional coats if required. In order to get an idea of the colours, I painted directly onto some of the remaining parts of the set one example of each colour. These were applied with a wet brush and each part received two coats. Thanks to John Jukes and Jon Murphy who pointed me in the right direction for US Army Uniforms and provided a number of good links. I was now on route to matching the colours to the uniform and equipment. There are some useful links in this thread. Thanks guys. 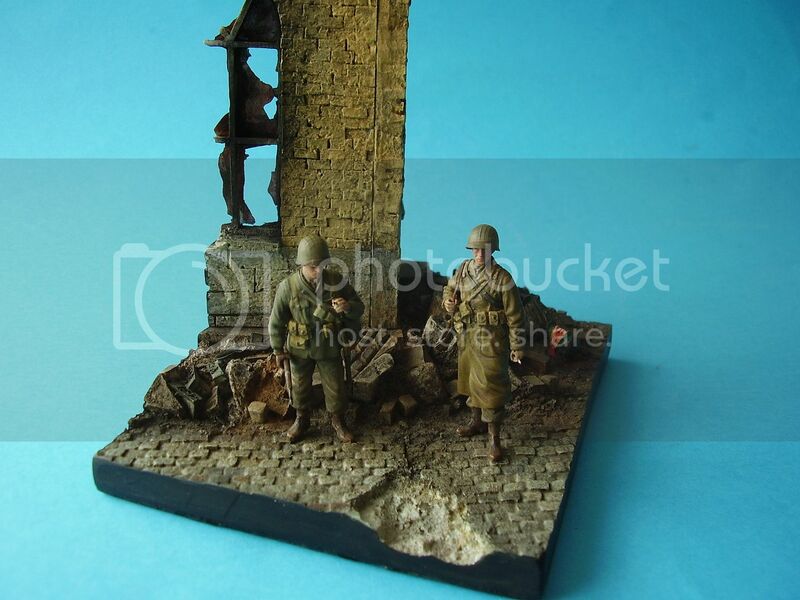 Following the images of the two painted figures, the wool overcoat chap has had 2 coats of UA 419 Olive Drab Light Mustard and the trousers UA 421 Olive Drab M1943. The standing rifleman has had his jacket painted in UA 421Olive Drab M1943 and the Trousers in UA 422 Wool Olive Drab 1943 so that you can see the difference. The M1943 uniform was I believe all Olive Drab M1943. His webbing has had a coast of UA 419 Olive Drab Light Mustard with the haversack strap being painted UA 420 HBT Dark Shade. For contrast I’ll paint the bandolier in Tamiya XF 57 Buff. The heads have two coats of UA 709 1st Base. The paint flows easily off a wet brush and covers well with little effort and no brush marks. Next I painted the webbing on the woollen overcoat, I used Tamiya XF 57 bull for the straps and UA 420 HBT Dark Shade for the haversack strap. I added some shading to the faces with a mix of UA 708 Flesh 1st Light and UA 711 Flesh 1st Shadow. Having checked out UA 422 Wool Olive Drab M1943 I repainted the trousers in UA421 Olive Drab 1943. One of the really nice things about LifeColor paints is that it takes so little to cover an area, the paint is really a pleasure to work with. Having played around with the colours a bit I then went back to building up the figures, adding the webbing and equipment. The final two pictures show the progress so far and I hope give you a better idea about the paints. I’ll call it a halt there or this review will be a long time in finishing. The paints are super easy to use either by brush or from all I have read and heard by airbrush. The colours would seem to be a good match to those used by the US Army. I don’t have a paint chart to compare them to, but you can see the results yourself. You need a tiny amount of paint as it flows very easily, so the pots should last a fair time. I particularly like their Fresh Set and although my knowledge of US Uniforms is minimal I think the troops are turning out to a reasonably acceptable standard, which at the end of the day is what one wants. For a review of Set 2 in this series, go Here on Armorama. Highs: Super easy to use, a good match for the colours offered. Water based so easy thinning and clean up. Lows: I didn’t have any. I found the paints easy to use. Verdict: I would have no problem recommending these paints, they are very easy to use and appear to be a good match for the colours suggested.